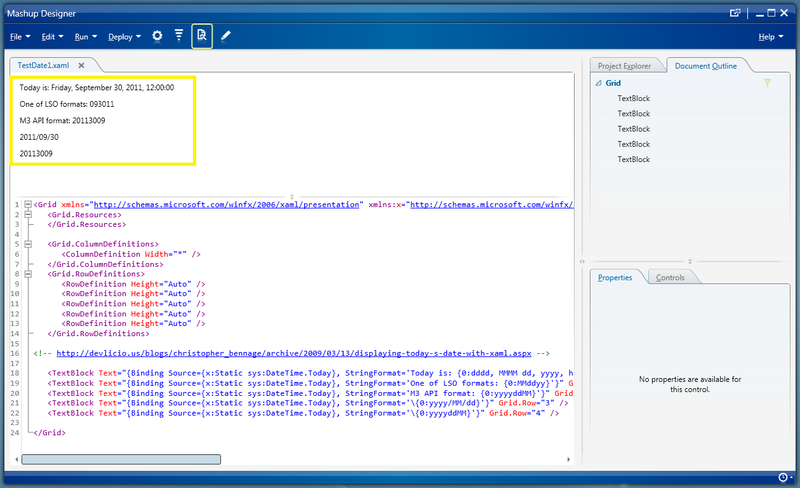 I found this post about getting the current date in XAML. I gave it a try in a Mashup. Here’s the code to get the current date and time in various formats in a Mashup. You can complement this with the Date picker in Mashup. Is it possible to display , the first day of the current month ? Is it possible to bind a date where it is today MINUS 14 days? Why shouldn’t this line of code work? I have done a bunch of researching how to call a JScript from a Mashup and it feels like it will not work. I did in fact create a JScript with a date funtion however I can’t seem to use it from the resource in the Mashup; even though it is in the manifest file. I’ve seen Karin’s post where the subject was brought up and the response was that it doesn’t work. When you say “script” would that mean a C# script? I have existing JScript running in the Mashup but it doesn’t seem to work the other way around. I guess the correct way would be to create a Converter with the Smart Office SDK. I think this would be far easier to create a simple web service with some parameters. Thoughts? Bonjour Christian, I don’t know how to do that in XAML alone. You will probably need to create a converter in C# with Smart Office SDK, or ask karinpb on the Smart Office blog. Hi Christian, it is possible to initialize a datepicker to the first date of the month. But now I am trying to regenerate this field’s value when I click on a button (to get the new current time). Is there any way to force this? are people still out there?